Charles Ross & Son Company now stocks three sizes of its V-Blenders. 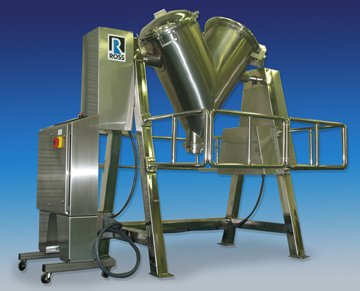 All Ross V-Blenders are supplied with Intensifier bars to permit delumping and deagglomeration as needed. Discharge is accomplished through a manually operated Butterfly valve. The valve is positioned 24" from the floor when in the bottom position. Appropriate safety railings, safety interlocks, Stop-Start and E-Stop Pushbuttons are included with all blenders. Additional information can be obtained by contacting: Warren Ang - Product Manager at 631-234-0500 or Toll Free at 800-243-ROSS.